So, I pulled into the valet at one of the casinos the other day for a meeting. The valet immediately started going into the fact that the services of Hangover Heaven were completely unnecessary, as the only thing people needed to do was drink more water. I entertained his conversation for a bit until he said, “Yeah, I just finished my chemistry degree at San Jose State.” At that point, I had to walk away. Alcohol causes dehydration because it inhibits a hormone called anti-diuretic hormone (ADH.) This hormone has a constant level in the body and keeps you from peeing out all of the water in your body. When you drink alcohol, the level of this hormone becomes low and you pee more. While this happens, you are also losing salt. One alcoholic drink can result in up to a pint of urine production. This effect becomes less as you drink more. But, if you drink 15 drinks in a night, you can end up well over two liters dehydrated. Dehydration causes nausea, headache, and dizziness just by itself. Inflammation makes this even worse. It is like a double whammy. As a person gets older, the effects are more significant, as it takes longer for the body to rehydrate and get rid of the inflammation. 1. 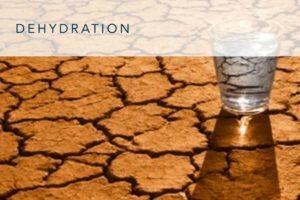 Even though dehydration is only one component of a hangover, try to drink 8 oz of water after every two or three drinks. Also, try to eat some bar food. Most bar food is salty. You need to replenish the salt you lose, as the electrolytes are important. 2. Also, try to drink at least somewhat responsibly. If you are in Las Vegas for a 4 day bachelor party, try to pace yourself. If you completely blow it out the first night, it is going to affect the rest of your vacation. If you do find yourself dragging by the 3rd day, try to make it by Hangover Heaven for a salvation package with vitamins and antioxidants. When you drink alcohol, you use up your stores of vitamins and antioxidants, which help process the alcohol and inflammation out of your body. 3. Drink high-end, clear alcohol. High quality vodka, gin and clear tequila have lower levels of impurities. These impurities lead to more acetaldehyde and similar substances. These are what cause inflammation, which is the key component of a hangover. 4. Eat a decent meal before you go out. Meat contains many amino acids and B vitamins, which are necessary for processing alcohol. Food also delays the absorption of alcohol. So, hit one of the steakhouses in Vegas before a night at the club. In the end, I had to walk away from the valet with the chemistry degree. I appreciate his eagerness, but I think he has a bit more to learn about treating hangovers. Hangover Heaven has treated thousands of hangovers and I have done over 6000 anesthetics. Between Hangover Heaven and my anesthesia practice, I believe I have been responsible for administering over 20,000 liters of IV fluid. I think I know a little bit about hydration. In my experience as the only hangover specialist on the planet, all the IV fluids in the world will not solve a Las Vegas level hangover without other medications and supplemental treatments. Learn more about Dr. Burke’s Hangover Support Supplements here. Learn more about the Hangover Heaven IV Hangover Cures here.